Our planet is a wonderful creation–from high mountains to deep swelling oceans; long barren desserts to dense forests; flowing rivers to cloudy skies. Since prehistoric ages, artists have been finding endless inspirations in the profuse beauty of nature and creating beautiful landscape artworks. A well-designed landscape is inspiring, enthralling and at the same time elegant. It provides a sense of calmness, liveliness and a balance in our morbid lifestyle. Landscape is a most popular art form that creates astonishing ambience around its surroundings. Landscape artists can capture their vision of the earth in a variety of ways. A landscape painting is all about drawing natural scenery such as mountains, cliffs, rivers, valleys, forests, trees, etc. These artworks are not confined to the representation of lands. However, they can also involve different styles such as seascapes, skyscapes, riverscapes, cloudscapes, or citiscapes. The Starry Night, The Hay Wain, and The Sea of Ice are some famous landscape paintings created by renowned artists around the world. Landscape– This is one of the most popular scapes that depicts natural elements of a panoramic scene. In such kind of art style, you will see a foreground of lush green grass, backdrop of sky, a mid-ground containing horizon line or sun setting. It can be created from plein air or from a photograph. “Plein air” is a French term indicating painting is created in the open air. One of the major benefits of creating painting in the open air is that artists capture the real beauty of nature and its hues in their paintings. On the other side, drawing landscape from photograph means artist is creating painting in the comfort zone of his/ her studio without any effect of daylight or weather. Skyscape– It represents the beauty of sky, especially in the form of painting or photograph. Skyscape art can eliminate the land from the picture because artists primarily aim to highlight sky and its different hues. The skyscape can also include clouds, and the plane on which art is painted kept slightly upward. The artist try to capture ambitious atmosphere of sky and weather of the wonderful natural space surrounded by the cloud. Undeniably, hanging skyscape art is a magnificent way to adorn your home. Moonscape– This art style demonstrates an area or vista of the lunar landscape. A visual representation of moon shades on houses, rivers or seas can be described in these paintings. In fact, it is closely related to the skyscape except that it includes moon. You can even see the moonglade–reflection of the moon on water in this landscape art style. Seascape– It is basically a visual depiction of the sea or beach scenes. In other words, it is an example of marine art. This kind of scape design can range from tumultuous waves to the tranquil, translucent expanse. A pictorial view of sea-adjacent land, coastline and sea within an area comes under the seascape painting. Hanging such kind of art in your home can enthrall your surroundings and widespread a continuous positive feelings. Cityscape– A cityscape can be connoted as urban equivalent of a landscape painting. It is also known as townscape. In middle ages, cityscape appeared as a backdrop of portraits. In modern century, the impressionists capture the atmosphere and dynamics of mundane life in a city. Industrial areas, suburbs and township are increasingly become the subject of cityscape painting. It is a modern twist on genre of landscape paintings. In this style, an urban setting including busy road, traffic, buildings and sidewalks are depicted. Inscape– Inscape represents the inner landscape that is created in the mind of artist. In this kind of art style, an artist tries to capture his/her mind on the canvas. Artists create a three-dimensional image, typically with a finish of abstract art edge. Landscape is a widely popular art form long before the invention of digital age. With different nature’s palette, it builds the connections with viewer’s imagination. When you are thinking about home renovation, it is good to pick a beautiful landscape painting that not only spread cheerful ambience, but also add special effect in your home. 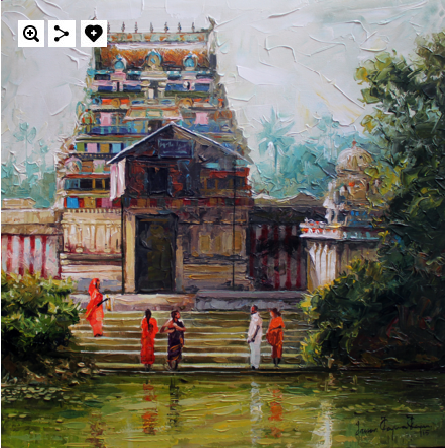 You are currently browsing the Indian Art Blogs blog archives for February, 2016.